1. 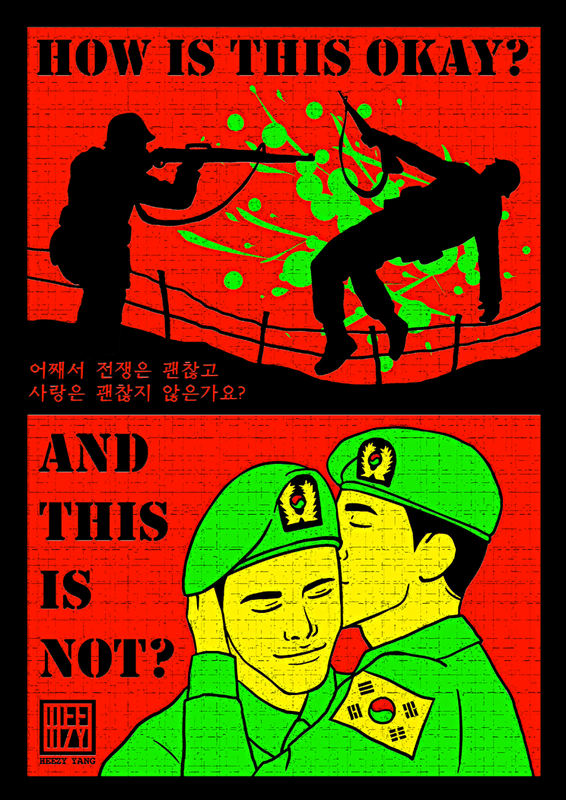 Korean army must release the soldier who's imprisoned for being gay. They must change the military law and bring the world where 'being a gay solider' is not illegal. 2. 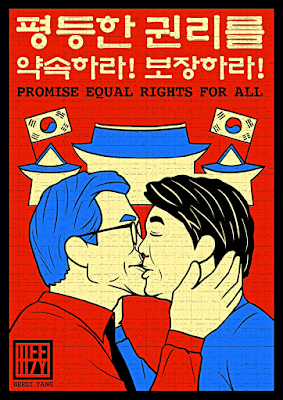 Korea's presidential candidates must promise the equality for all, including sexual minority. 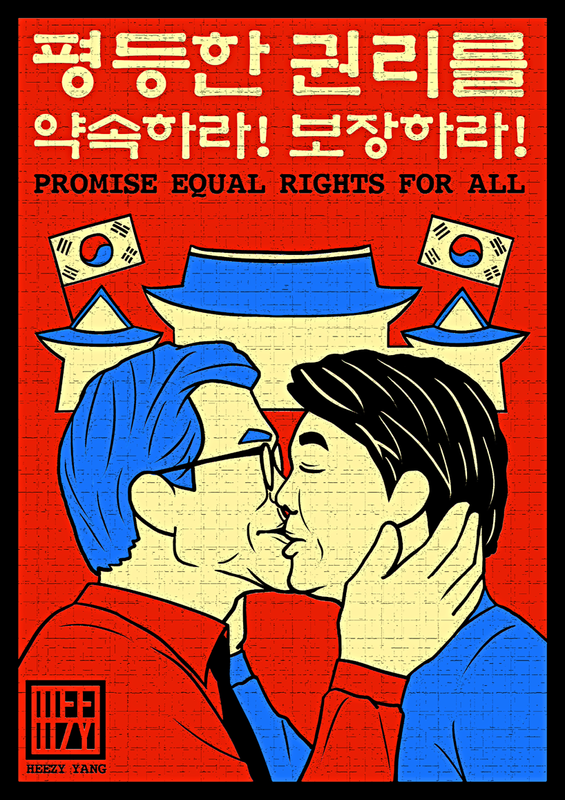 They cannot pretend LGBT issues don't exist in Korea forever. They cannot always go against the queer people because they're afraid of Christians in the country. We deserve the same human rights. 3. Korean police and anti-queer Christians will not take away this beautiful and peaceful event that is Seoul Pride. This year, the city (Seoul) has not given us the approval for using Seoul Plaza on the 3rd of June for Seoul Pride. We won't stop. We will keep fighting for what is right. 1. 육군은 동성애자라는 이유만으로 수감된 병사를 당장 풀어주어야 합니다. 말도 안되는 군법또한 수정되어, 동성애자 군인이라는 사실 자체가 불법으로 간주되지 않는 세상이 와야 합니다. 동성애자들도 국방의 의무에 따라 똑같이 복무를 합니다. 동등한 의무를 다하는데, 동등한 권리는 커녕 수감이라니, 엉터리도 이런 엉터리가 없습니다. 2. 대선을 고작 몇 주 앞두고 있습니다. 대한민국 대통령 후보들은 동성애자를 포함한 소수자들, 모든이들이 같은 동등한 권리를 누릴 수 있는 대한민국을 약속해 주십시오. 도대체 언제까지 성소수자 인권과 관련한 문제들이 존재하지도 않는 양 모르는 척 하거나, 기독교 세력의 눈치를 보아 성소수자들의 권리를 짓밟는 정치인이 되실겁니까? 우리는 우리의 인권을 존중해주는 대통령을, 정부를, 나라를 원합니다. 3. 대한민국 경찰과 보수 기독교 집단은 긍지와 평화로 가득한 우리의 축제, 퀴어문화축제(프라이드)를 빼앗아갈 수 없습니다. 올 해에는 6월 3일에 퀴어문화축제가 열릴것으로 기획되었었으나 서울시측이 이에 대한 서울광장 사용 허가를 내주지 않았습니다. 우리는 멈춰선 안됩니다. 부당함에 맞서고 계속 퍼레이드를 해나가야 합니다.